Juhi Chawla was wearing a very loud and tacky RED colored suit. She carried a glittery clutch with it. 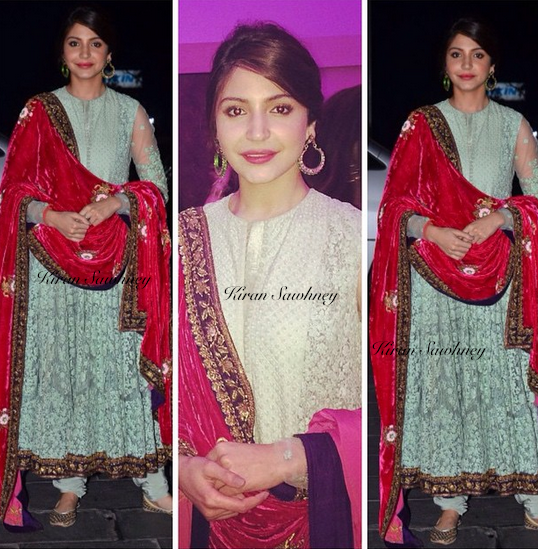 After many days, we have seen Anushka Sharma in something more formal, more Indian. It was a refreshing change. She wore a pistachio green Sabyasachi long anarkali with red velvet duppatta. She paired it with mojris and big balis. It is not our favorite outfit but for her effort, we do applaud her. Malaika Arora wore a simple, candy pink, Seema Khan sari with a shimmery blouse. She paired it with diamond chandeliers and bangles. She looked good. Gauhar Khan wore a long HEAVY anarkali by Rozina. Her jewelry was by Anmol jewelers. It seemed overdone. But she looked nice. Jacqueline looked quite bad in her tacky outfit. She wore Shehlaa by Shehla Khan. It was pink tissue with silver motifs and silver lace and a lot more. A straight lehenga with long puff sleeve, blouse. She did not look good. Deepshikha wore a white sari with red and green border. We do not like it much. Finally the bride and the groom. Shirin Morani and Uday Singh.